Rising majestically above the 600 acres beach front estate and the resort of ANSE CHASTANET, JADE MOUNTAIN is a cornucopia of organic architecture celebrating St. Lucia’s stunning scenic beauty. High on Morne Chastanet, overlooking St. Lucia’s Piton World Heritage site and the Caribbean Sea, JADE MOUNTAIN is the resort within a resort of ANSE CHASTANET. 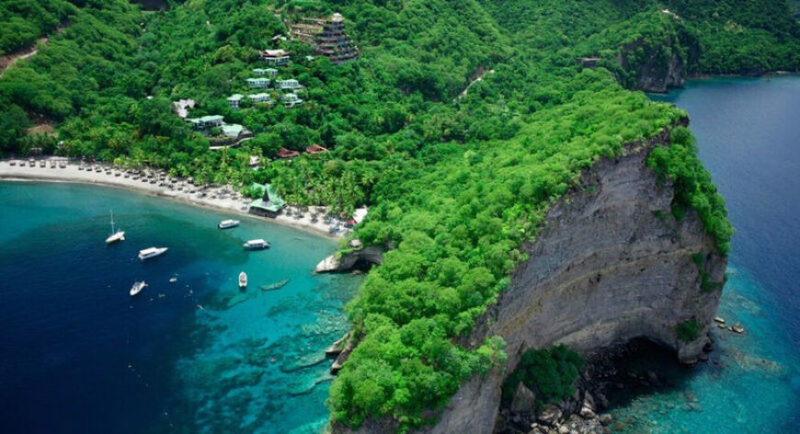 ANSE CHASTANET’s architect owner, Nick Troubetzkoy, has expanded upon his philosophy of building in harmony with Caribbean nature and environment by introducing a new level of sophistication in the design of JADE MOUNTAIN with its extraordinary infinity. Yoga at Jade Mountain – meet on Celestial Terrace – 7 am – 8 am. Wine and Canape Reception on Monday from 5.30pm – 6.30pm. Creole History Class in the Beach Bar Friday 11.30am. Underwater Slideshow in Beach Bar, Wednesday 7 pm. History, benefits, and uses of Aromatherapy presented by our Spa Manager in the Spa Retail Boutique Thursdays from 3.30pm. Chocolate Sensory Tasting at Emerald Restaurant, Tuesday from 10 am – 10.30am. 1.5 miles North of Soufriere. All infinity pool sanctuaries and the Sky suites have king size beds. Upon request, twin bedding can be provided or an extra bed added. In room, facilities include fridge, tea/coffee maker, hairdryer, iron and ironing board (a member of housekeeping will gladly perform the chore). The SUN and GALAXY sanctuaries also feature a separate small wine cellar stocked with fine wines which are available at a charge. All categories have Molton Brown bath amenities, Frette Towels, and Bathrobes. There are no televisions, radios or telephones in the infinity pool sanctuaries and Sky suites in keeping with the overall resort experience. Guests have the option to contact the Major Domo or Reception team via their Firefly communication device. Wi-fi is available inside the sanctuaries on request. Cell Phones enjoy good reception, providing the service provider covers the region. It is recommended that guests enquire with their cell phone provider prior to travel. Guests are asked to refrain from using their cell phones in public and keep them on vibrate setting whilst on property. In addition to locally made fine tropical wood furniture an eclectic collection of furniture has been placed in the sanctuaries giving each one of them their own individualistic ambiance. The living areas of the rooms are finished with more than 20 different species of tropical hardwood flooring and trim harvested in an environmentally correct way. A multitude of hardwoods have been used including Purpleheart, Greenheart, Locust, Kabukali, Snakewood, Bloodwood, Etikburabali, Futukbali, Taurino, Mora and Cabbage Wood. The bathrooms have tropical hardwood vanities with fine brushed stainless steel or nickel plated European fixtures. They feature smooth, cool, coral tile floors and shimmering handmade glass tile shower walls and high tech stainless steel shower units with powerful massage jets and gentle rainfall shower heads, polished mirrors, custom light fixtures, porcelain wash bowls, adjustable makeup mirrors and hair dryers. Each bathroom has a large whirlpool tub for two on a raised dais overlooking your room, pool and the view. The whirlpools are all equipped with strategically placed point-massage jets that can each be controlled by guests as they wish. Each tub is also equipped with the very latest in ‘chroma-therapy’ – based on the theory that colors affect biorhythms and life equilibrium. JADE MOUNTAIN’s sister property, ANSE CHASTANET, is directly adjoining JADE MOUNTAIN and therefore, all Anse Chastanet facilities and services are easily accessible for JADE MOUNTAIN guests. Each of the infinity pool sanctuaries at Jade Mountain have been individually designed. The room categories have been created to reflect the square footage of the sanctuaries, size of pool and the scope of the view. 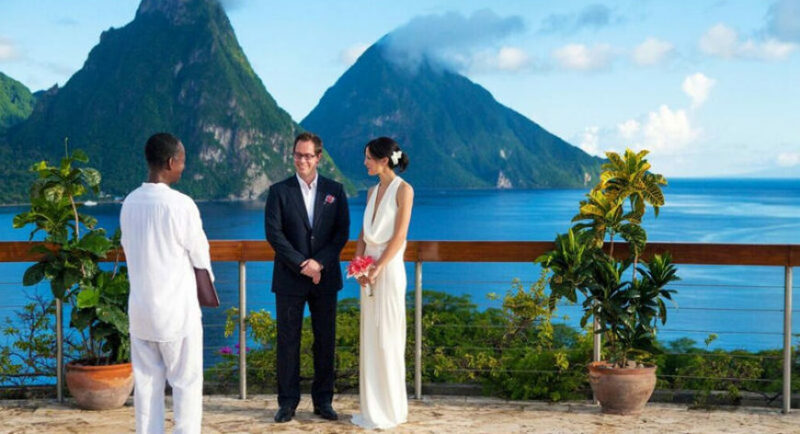 Please note that all suites have a phenomenal view of the Pitons and the Caribbean Sea. An additional panoramic quality to the view is provided by sanctuaries on particular elevations and those located on corners. 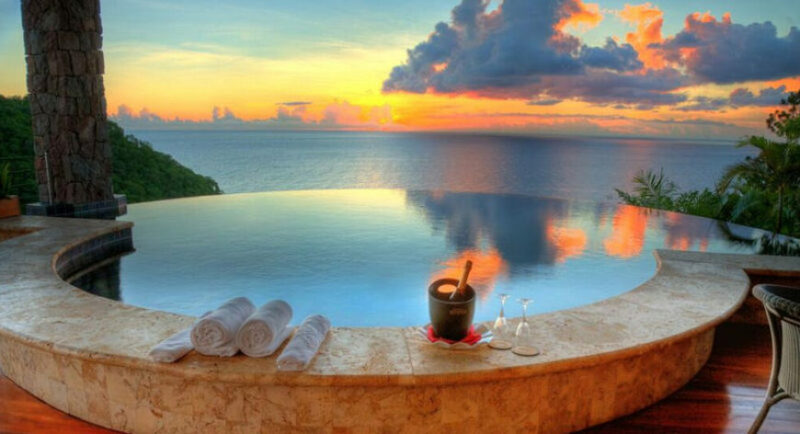 In addition to the 24 infinity pool sanctuaries at JADE MOUNTAIN, there are 5 SKY jacuzzi suites. The infinity pool sanctuaries which are between 1400-1800 square feet and with infinity pools averaging 450 square feet. The infinity pool sanctuaries which are between 1600-1950 square feet in size with infinity pools averaging 650 square feet. The infinity pool sanctuaries with the most commanding 270 degree panoramic view, with up to 2000 square feet in size, and in particular elevated positions. The infinity pools are up to 900 square feet in size. The combination of additional square footage and amazing panorama makes these sanctuaries the most desirable for all those seeking the ultimate experience. 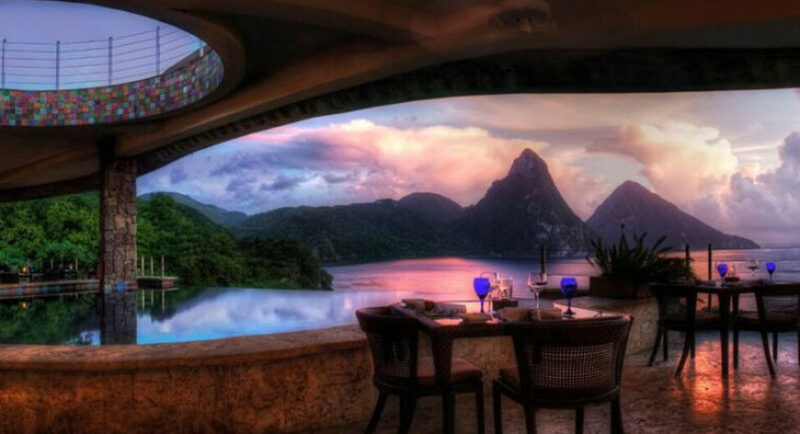 The SKY suites are located in the lower hillside level of JADE MOUNTAIN. While the SKY suites do NOT have an infinity pool they are part of JADE MOUNTAIN and guests will enjoy all of the JADE MOUNTAIN privileges. The SKY suites are very spacious suites of about 1650 square feet, with the 4th wall open, yet completely private, to maximize the amazing view experience of the Pitons and the ocean. SKY suites feature a two level room lay out, with a large and comfortable living space and open bath design, with a raised Jacuzzi tub towering above the living space and also open to view. Wrapped around an infinity pool with a dazzling kaleidoscope of colors, the Jade Mountain Club caters exclusively to resident guests, celebrating James Beard Award winner Chef Allen Susser’s “Jade Cuisine”. Hovering in space above the Jade Mountain Club is the Celestial Terrace, perfect for sunset cocktails or star-gazing. 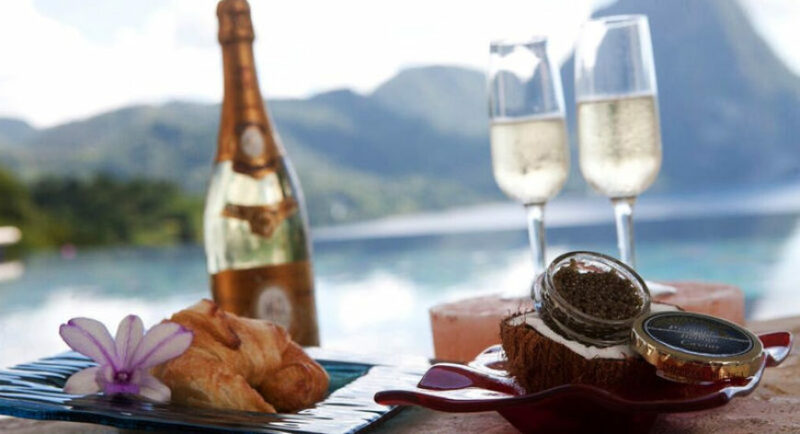 In addition, Jade Mountain guests have unlimited access to all restaurants and bars at Anse Chastanet, which are just a short downhill walk or a brief shuttle ride away. There are 3 restaurants/ 2 bars plus the Jungle Beach Bar & Grill on the second beach of Anse Mamin. At mid-level hillside, near reception, there is the Treehouse Restaurant consisting of two Treehouse open air structures with beautiful views of ocean and the surrounding hills and the Piton Lounge and Bar with Piton and Ocean views, At beach level and right on the water’s edge is the Trou au Diable beach restaurant and bar. The Jungle Beach Bar & Grill is located on our second beach of Anse Mamin, accessible by our complimentary Shuttle Boat. A great variety of culinary experiences is on offer: Fine Caribbean Dining (Treehouses), Emerald’s Vegetarian, Apsara East India-St. Lucia fusion (Beach Restaurant/dinner time only) and the Beach Grill (Beach Bar/dinner time only) plus the Jungle Beach Bar & Grill at Anse Mamin beach for lunchtime meals. The Jungle Grill can remain open for private catering events in the evening if pre-booked. *Full Breakfast in our Treehouse Restaurant from 7am - 10am. *Afternoon Tea in the Beach Bar 3.30pm - 5.30pm. *Beach Bar open daily 8am- 11pm, Piton Bar open daily 8am until midnight. *Dining in our Trou au Diable Restaurant celebrating Apsara, St Lucia–East India fusion cuisine daily except Tuesday; A beach grill menu is also available. Open daily except Tuesdays. *Coco Doux coconut bar at beach bar on Sundays from 11am - 3pm. Piton Bar: 7am until closing around 11pm or later / Beach Bar: 9am until 11pm. / Jungle Beach Bar at Anse Mamin: 10am until 4pm. Enjoy sailing adventures on the 42ft Searenity. Anse Chastanet offers a variety of complimentary guided walks and hikes on property and in the surrounding region. Our guides are very informative and may be able to give you a new insight into history and life in St Lucia. Two (2) natural soft silver sand beaches. Second beach is accessible by the Resort’s complimentary Shuttle Boats (5 minutes). Complimentary beach chairs and beach towels. Wreck dive to Lesleen M on Fridays leaving 9.30am, Night Dives - Mondays and Wednesdays. Escorted boat snorkel trips are available to the surrounding coral reefs. Complimentary use of snorkeling equipment, stand up paddle boards, windsurfing, sunfish sailing, and ocean kayaking with resort kayaks (not Prijon specialty kayaks which are available at a charge as part of our KAYAK ST.LUCIA operation). 8 Miles of private biking trails on Anse Chastanet’s 600 acre estate plus 50 Cannondale F800 mountain bikes for rental. The Kool Kayaking Adventure is St. Lucia’s first professional kayaking adventure featuring Prijon sea-kayaks and trained guides for coastal kayaking adventures. The first session includes safety and technique instruction. There are five great tours to choose from… Kayaking the Coast of Soufriere Bay, Paddling to the Pitons, the Fishing Villages & Beach Picnic tour, Sunset Kayaking and Birdwatching Kayak Combo. A 300 year-old former plantation that is now a rainforest, Anse Mamin is a stunningly beautiful birdwatchers paradise. Our guided tour will allow you to discover numerous indigenous Caribbean birds as well as several species endemic to St. Lucia. Three different hummingbirds make their home here as well, including the Antillean Crested Hummingbird. Along the way, you’ll be treated to a tour of the old ruins of the plantation buildings with a fascinating description of the history of Anse Mamin. You’ll also learn about the many exotic plants and trees growing in the rainforest, some of them hundreds of years old. Binoculars provided. There is a small, air- conditioned fitness centre with Cybex and Life Fitness equipment next to the spa Kai en Ciel. Cardio equipment, multi–function workout station, benches and weights are available.